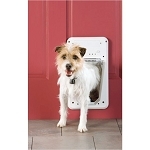 Electronic dog doors are popular because they allow access only to a pet wearing a special "key" on its collar. Using radio-frequency technology, these doors "read" the unique signal of a key worn on your pet's collar and triggers the flap to unlock. 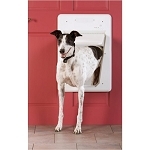 When the door no longer senses your pet's key, the flap automatically locks back into place. Animals without the key are not able to enter.